Looking good Dave ! That old gsxr looked a bit strange / 1100 ? Looked like it was on the gas / nos ? Glad you smoked him mate .. the mph is picking up as well !! Keep it coming ..
Looks good,,, Was that 10:15 @ 145? The launch is weak best 60ft 1.7 secs. Lock up is about right on arms , front lifts slightly in 1,2,3,4 static may need a little more pressure from extra shims as im not spinning off the line. The other bike is GSXR 1100 turbo. Looks odd as it's rear tail is chopped down etc. He's usually very quick off the mark. I was running with the boost backed right off but it still pulls strong through the gears and with the terminal speed it should be in the nines... More seat time maybe. The 11 will be a real fun road bike ! maxumis and andy1965 like this. PS Can't wait to see your 12 up and running as well ! Where did you get the cams from ? The 12r Cams are being made in the UK by Piper cams. Drag profile higher lift and will be degreed to shift up the torque and optimize the higher rpm I'm running at . Should have them back in a few weeks. 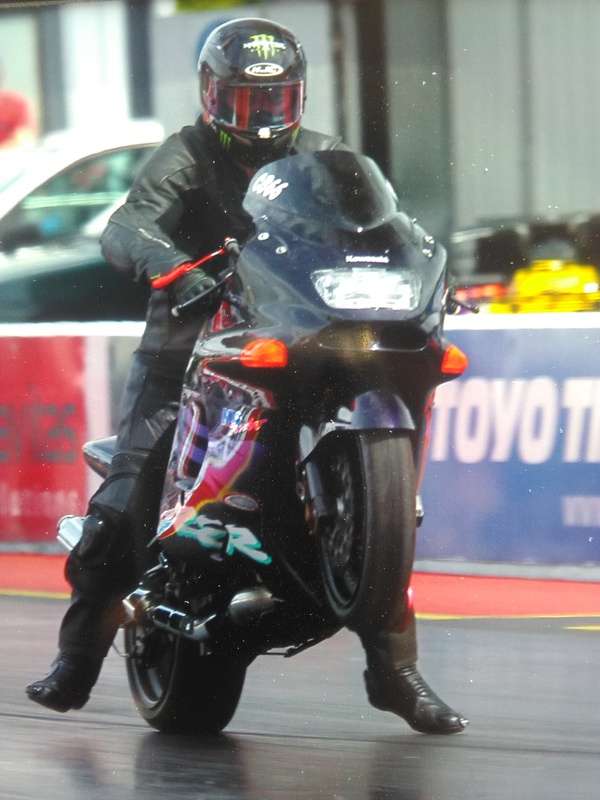 Well the 11 ran pants at the weekend best et was 10.2 , 60 ft poor except one at 1.6 secs came at the expense of a mega 70 ft wheelie but it was my 10.2 run. Trying to see if anyone videod it . I let go on boost and it just locked up and went skyward. I backed off , missed 3 gears and still did the 10.2 so in retrospect it should have been a high nine if I hadn't ridden so bad Lol. BIRD B GONE, maxumis and andy1965 like this. Awesome pic Dave :) Once you have it set you will be Well into the 9's .. I was running with the boost backed right off but it still pulls strong through the gears and with the terminal speed it should be in the nines... More seat time maybe.?? ?